At the recent annual convention of ARCHI (Asociacion de Radio Chile) in Copiapo, Chile, radio broadcaster Nostalgica FM (www.radionostalgica.cl) was on hand to cover the event for its listeners back in Santiago. Making the event even more compelling was the presence of four very special guests at the opening dinner and reception. The ARCHI event was held not far from the site of the mine that captivated a worldwide television audience in the Summer of 2010. 33 miners, who were trapped 622 meters below the surface of the San Jose mine, were eventually rescued after 69 grueling days trapped in unimaginable circumstances. Four of the 33 Chilean miners were on hand to welcome the broadcasters to the Copiapo Province as ambassadors for the region. 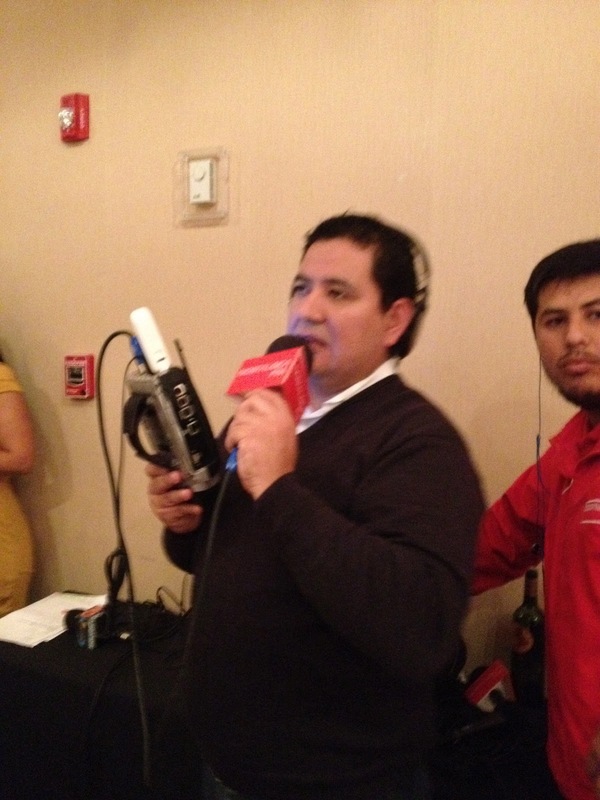 Nostalgica FM was able to use the meeting room's Wi-Fi to connect back to their station using their Comrex ACCESS Portable IP Codec to broadcast the event in its entirety. Also at the event was Comrex Latin America Sales hombre, Jim Godfrey, who in addition to loving "rubber chicken" never misses out on an opportunity to glom onto somebody else's 15-minutes of fame. On word that a Hollywood movie will now be made about this miracle rescue, Jim immediately suggested that actor Clint Eastwood should be chosen to play the part of Jim Godfrey for the silver screen re-enactment. Jim offered his services to Mr. Eastwood as a dialect coach to help him best emulate the East Texas accent. All kidding aside, congratulations to the miners and to our friends at Nostalgica FM for great radio coverage for their listeners.